Do you ever lose your train of thought when talking to someone? Everything is fine and then that old familiar feeling creeps back…your anxiety. You start to panic on the inside and completely lose the words. You become self-conscious and are looking for a way out of the conversation. I’m reading a viewer comment about a problem they experience that you may be able to relate to and sharing what you can do to overcome this problem. Sebastiaan: Hello, this is Sebastiaan from social-anxiety-solutions.com. I’m a former social anxiety disorder sufferer and a social conference coach and I’ve been coaching socially anxious clients for the past nine years using combination of Western traditional psychology as well as the new and emerging and exciting field of energy psychology. And so, I released these videos each week and sometimes I pick a question that is posted onto one of my videos and that’s what I’m going to do right now. So, here we go. By the way while I look this up I also do a podcast in iTunes and there I interview psychologists, coaches, healers, psychotherapists, researchers, best-selling authors for their best social anxiety secrets. It’s called social anxiety solutions. Under that name you can find it in iTunes where you can go to my website social anxiety solutions. You can listen there and download the episodes there. Alright, so, the question was a comment, but I thought I share something that might be helpful to both the girl asking and hopefully to other people as well. Alright, so here we, go by Kenti. 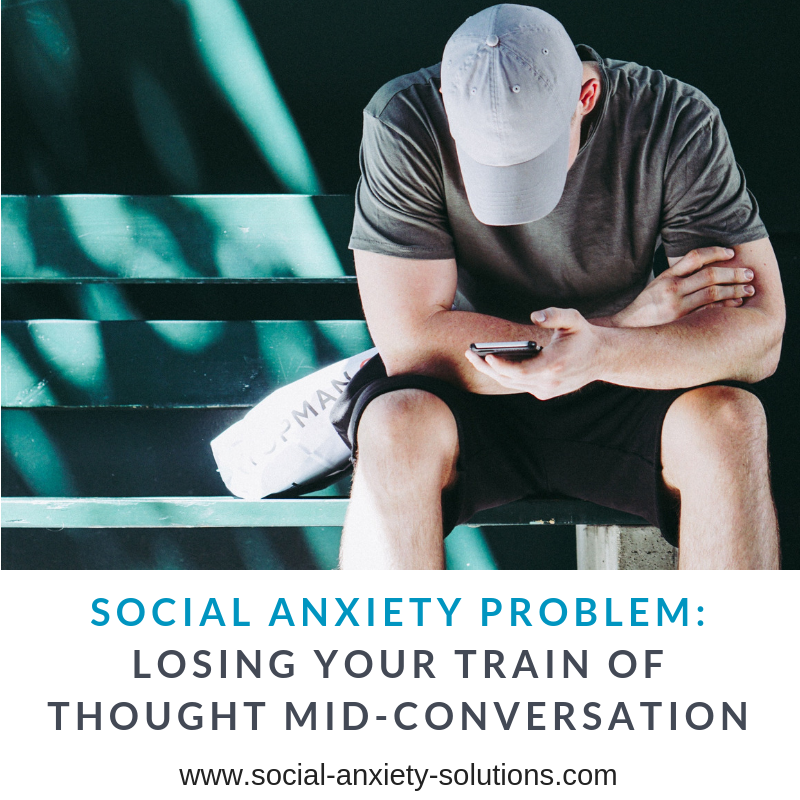 My problem exactly is that right in the middle of the conversation – it could be over the phone or in person – I get the sudden thoughts or sometimes just the emotions itself. I could be fine totally in the conversation and the person can perceive that I’m anxious at that moment and it makes me feel lost in the conversation and I don’t know what to say which actually makes me come across like a boring person or not interesting or intelligent and then I feel horrible and ashamed, no good and of course don’t like myself. The weird thing is that sometimes it can be totally fine, not very often though, and feel confident loving and connected with people. I don’t know I’m so confused. So, Kenti, thank you for your comment and I just wanted to say a couple of things about it. Let me just put this down on my fantastically official recording studio. Yeah, so, what you’re saying is like “Oh, I’m in the middle of a conversation on the phone and then when I think that someone is thinking that I’m anxious now I lose my train of thought, I can’t focus anymore and then the rest of the whole shitstorm starts”. Okay, so, what’s happening in that moment is your non-acceptance of your anxiety shows up, your fear of your anxiety symptoms and a lot of people noticing it, it becomes present. So, in your brain currently it’s the anxiety symptoms themselves that you’re experiencing, the heart beating faster, the lump in your throat, sweating, tightness in your chest, tightness in your stomach you name it whatever the symptoms are for you. These symptoms themselves have become a trigger for an even stronger fight flight freeze response so your brain has linked it to the social anxiety symptoms as dangerous and on top of that what other people think of you about being anxious is also linked in your brain as dangerous. So, in your mind you’ve got it linked that whenever ‘I feel social anxiety – I don’t like myself’, right? So, you’ve identified yourself with the social anxiety. So rather I’m feeling these uncomfortable sensations in my body – “Wow, that’s uncomfortable”, now it’s like I feel these uncomfortable sensations so there’s something wrong with me and a horribly ashamed of myself and how can I possibly like myself – That makes the problem worse and then there’s the shame on top of it and it’s all connected. And so, it becomes this big entangled mess so what you want to do is you want to untangle the mess, easier said than done, and you want to come to terms with the status quo. 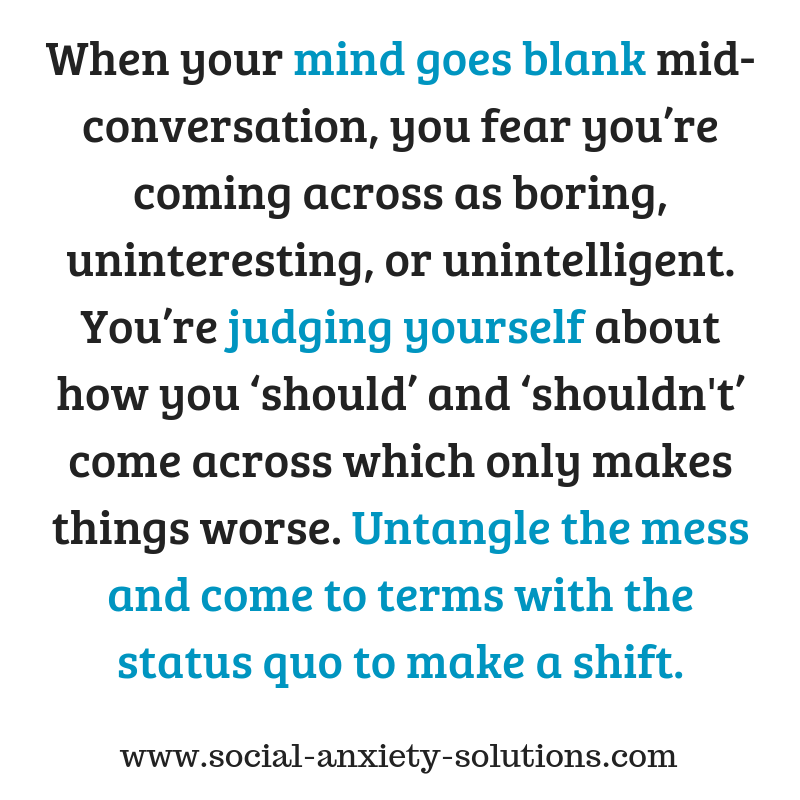 So, the status quo is what’s going on for you right now, what’s going on for you right now is you have a problem with social anxiety. You get triggered your brain is perceiving potential threats and it’s alarming you about those potential threats and you’re dealing with feelings about the status quo, about the fact that you have a problem and you’re judging yourself for the fact that you have a problem. All of these become tappable targets. So, in the beginning of this video I said that I specialized in using Western traditional psychology and Eastern energy psychology. Eastern energy psychology is an umbrella term for techniques like psych-k, emotion code, logosynthesis, attention-based energy processes, tapping acupressure techniques and a wide variety of other ones but the most well-known one is called EFT. It stands for Emotional Freedom Techniques. It’s used by tens of millions of people worldwide, video went viral of where they had implemented EFT in the schools and I think the last time I checked it at 50 million views. That there have been more than 100 peer-reviewed studies done on the effectiveness of this technique. It’s amazing, I use it to overcome my own social anxiety and have helped hundreds of people overcome their own social anxiety with it as well. So, it’s scientifically proved to be effective, it’s amazing. So, you can use that technique and it’s a tapping technique where you tap on specific acupressure points in a body. Now if you see this for the first time you are probably like “Yeah, right dude, that’s really weird” and that’s right it is really weird, but it works really well as well. So, what it does is when you’re stimulating these acupressure points, it’s like a psychological form of acupuncture and you think about something that’s upsetting you say an upcoming meeting then the stimulation of these acupressure points sends a little signal to the part of your brain called the amygdala which regulate regulates your hormones and studies have shown that it decreases the production of cortisol and it increases the production of serotonin your happy hormone. These biochemical responses create a sense of calm. So, you think you about the thing that upsets you – this upcoming meeting, you start doing the tapping while you think about what upsets you and then the tapping starts to disconnect and release the excessive emotions that are connected to what it is that you’re thinking about. So, you can use that to aim very specifically at what’s bothering you. So, a couple of things are bothering you. You’re ashamed of the fact that you have social anxiety – that’s at a tappable target. So, you can focus on that shame and do the tapping. And you’re judging yourself for having social anxiety – that’s a tappable target, you can focus on that and do the tapping on it etc. right? So, learning about this technique and understanding social anxiety how it fits together your own psychology and all of that will lead you to get to a place where you can step-by-step overcome your social anxiety. 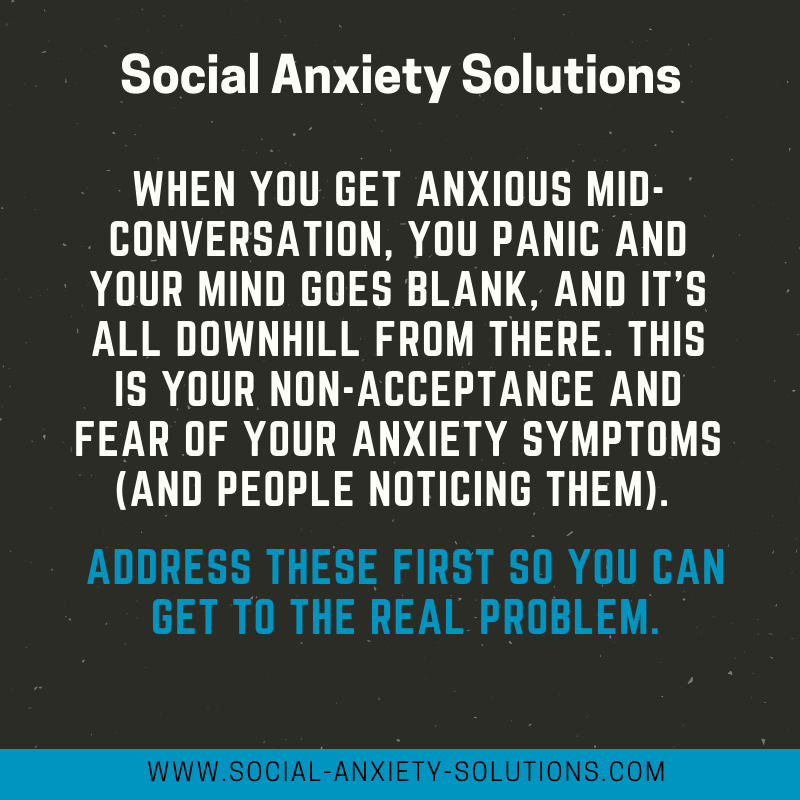 Now if you want to learn how to do that go to social-anxiety-solutions.com/ I have no idea what the fourth slash is go through my website and get the free social confidence starter kit there because I can’t explain in such a short video how you are going about that. In that starter kit I have 10 videos where I teach the technique to you by the way this is all for free and I also guide you through an experience of it so you can actually feel the feelings in your body shift. It is just hearing about this here you are probably like yeah right but when you actually start to feel your emotions move around in your body then it becomes a whole different experience. You don’t want to do that? Check out any of the I think you have more than a hundred videos out there on a whole bunch of them actually guide people through some of these experiences and read the comments underneath it. People are shifting their emotions this really works. Alright, and so, you can go to my website social-anxiety-solution.com and then there’s a little tab that says overcome social anxiety and that will lead you to the page where you can get those 10 free videos along with a free eBook where I talk about how I overcame my own social anxiety and what the 4 steps are to go from social anxiety to rock-solid social confidence. That’s it for this week’s video. Alright, I hope that was helpful. Thanks Kenti. for your comment, I appreciate it. And yeah, I release video like this every Thursday so subscribe here here somewhere and I will talk to you soon. Bye for now. 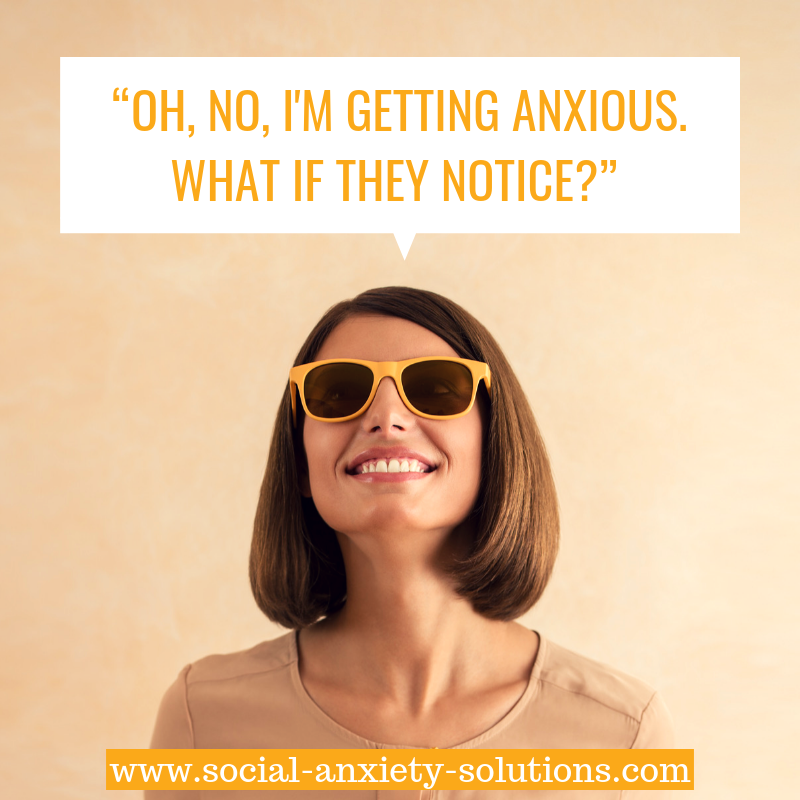 If you experience Social Anxiety, click below for a free video course to start to overcome it.